I had high hopes for posting this week before I venture off on my Christmas trip. Unfortunately, I'm stuck in bed with a nasty bug and am far my peak nor am I feeling very chic. 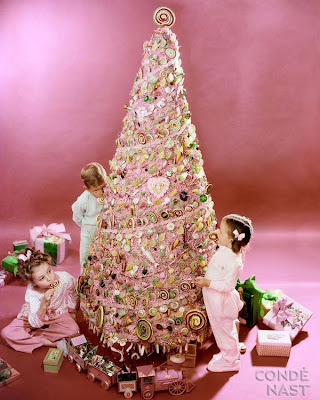 So I want to send each one of you warmest wishes for the holidays. Thank you for your kind comments and for the lively discussions that we have, and I look forward to continuing them in 2009. Hope you and yours have a safe, happy holiday and a happy, healthy 2009! 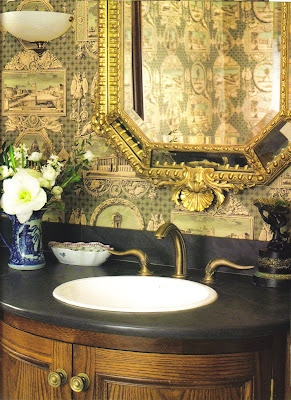 Many of you may remember that fabulous bathroom that San Francisco designer Benjamin Dhong decorated for the San Francisco Decorator's Showhouse. Well, I knew this man was talented and clever, but I didn't realize the extent of his creativity. Just look at this fabulous wreath that Ben designed for the holidays! Ben was inspired by some old architectural engravings that he had found, so he scanned them, arranged them, and then had them printed on linen. He took the fabric and glued it to a 20' foam square donut. Genius! The front of the wreath is the acanthus ornament of a Corinthian column while the sides have classic architectural motifs such as egg and dart. Ben joked that "decoupage is back". Well if this is decoupage for the 21st century, then count me in as its #1 fan! Images courtesy of David Duncan Livingston, photographer. 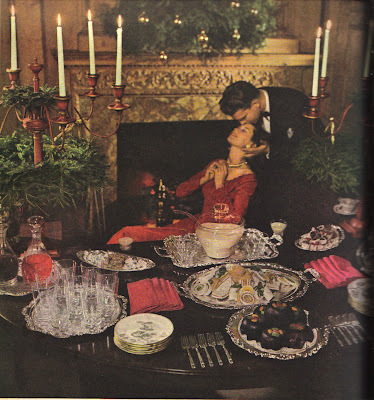 How long has it been since you've seen a Christmas spread in a magazine that did not include greenery of some type? A tree? A garland? A magnolia wreath? 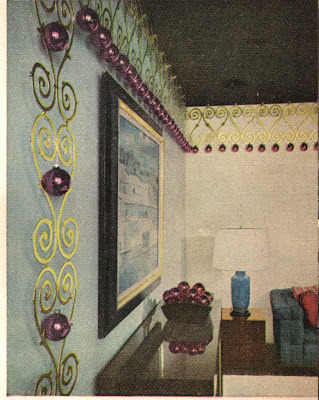 Well, this article from House Beautiful (Dec. 1954) was not a paean to things green and natural but rather a tribute to paper decorations. 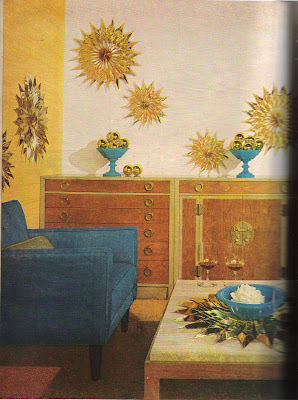 The gold scrollwork pieces and accordion pleated stars and geegaws were all made of paper and were sold on the market under House Beautiful's moniker. Now, I think the gold stars are kind of neat but I'm not so crazy about the baluster looking things. I really like the gold scrollwork pieces although I would use them in a more subtle way. And I don't think I'd hang ornament balls from them. That's a bit too kitschy for my taste. All in all, it's certainly evocative of that era and a far cry from today's more natural design. 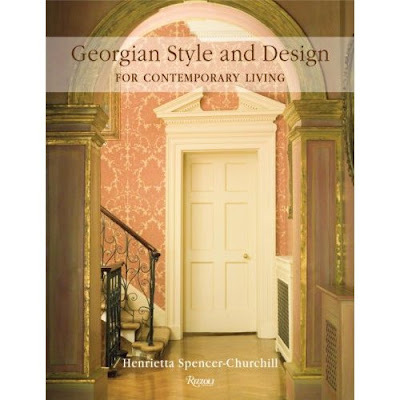 For those of you who are fans of Henrietta Spencer-Churchill, I think you'll enjoy her latest offering Georgian Style and Design for Contemporary Living . 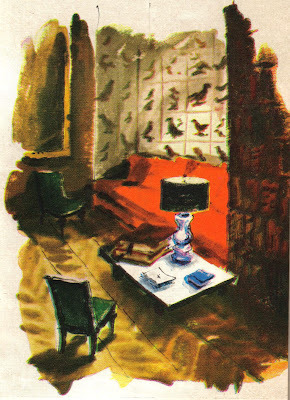 The book focuses on contemporary interpretations of the Georgian style with interiors that focus on comfort and functionality first and foremost. 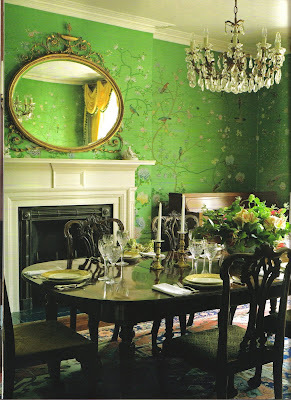 But what really struck me the most about the book were the lush wallpapers used in many of these homes. Gorgeous scenic and hand-painted wallpapers abound, and you know I've met very few of these wallpapers that I didn't like. How incredibly fabulous is this hand-painted paper that features an Indian colonial scene? It's perfection to me. Who do you think makes this? de Gournay? Zuber? 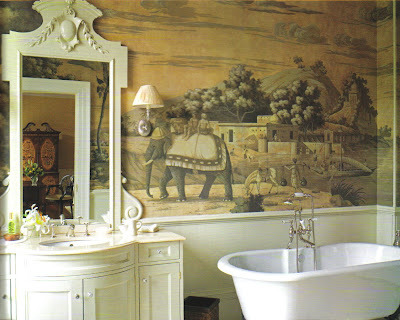 I have no idea who makes this architectural toile, but I just adore it. Featured in a 'gents' cloakroom, the paper sets the right masculine tone. 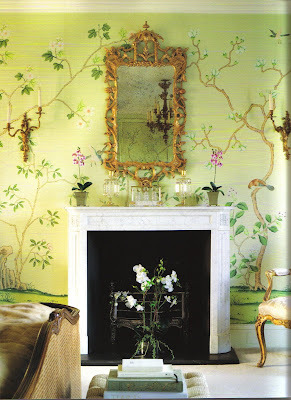 At first glance, I assumed this wallpaper might have been Gracie, but I'm really thinking it might be de Gournay. 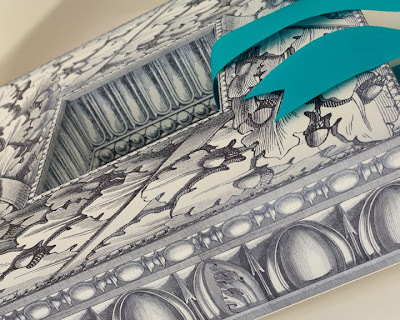 The book does not mention who the maker is, only saying that it's a hand-painted silk wallpaper that is produced (or perhaps I should say crafted) in China. 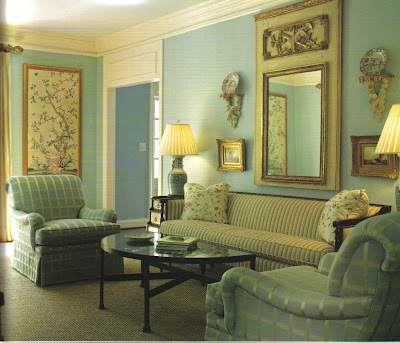 The wallpaper is custom designed and fitted for the specific setting. 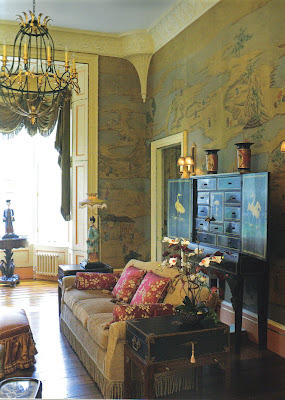 In this Scottish country house, the chinoiserie room features a hand-painted de Gournay wallcovering. I like how the colors are rather muted. 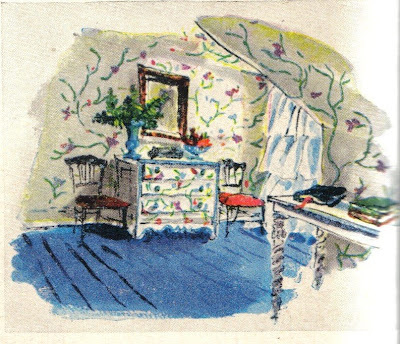 Another hand-painted wallcovering that was painted on silk panels and installed in this bedroom (again, I believe this is a de Gournay). I think that if my bedroom was papered in these panels, I might finally stop waking up on the wrong side of the bed-something that has been known to happen from time to time! 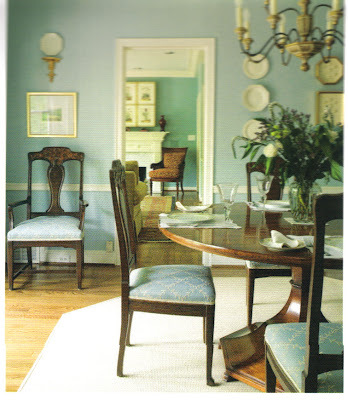 Although it has nothing to do with wallpaper, I also wanted to include a few images from one of the featured interiors that was designed by my friend Patricia McLean, an Atlanta designer. I love the various shades of blue that she chose. 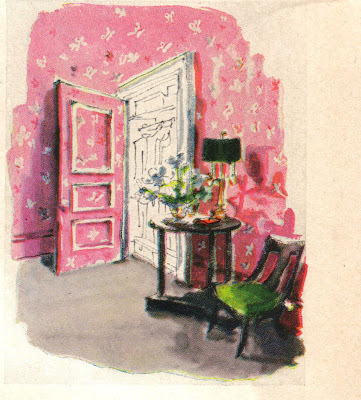 Or so House & Garden told its readers back in 1948. It seems that whenever there has been a downturn in the economy, magazines have made sure to include money saving tips amidst the images of beautiful and aspirational interiors. 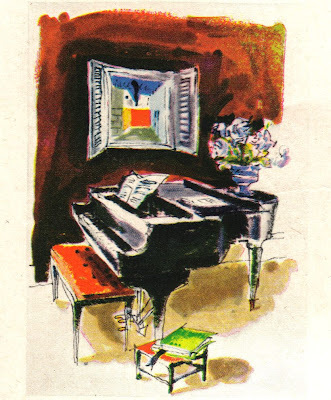 And in this sixty year old issue, H&G had all sorts of frugal tips. Of course, the one suggestion that came up throughout the article was the impact of a fresh coat of paint. Slap some paint on an old piece of furniture and voila! Instant and chic update. Some of the tips they gave are a tad dated, but there are some nuggets of wisdom here. And I love how creative Mrs. Gerard Lambert was. Just how much free time did she have to come up with such clever ideas? Who knows, but it makes me wonder what other tricks were up her sleeve. 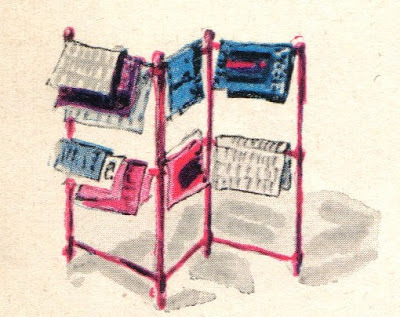 But I think the real reason I'm showing these images today is because the illustrations by Charles Heilemann are just charming, don't you think? 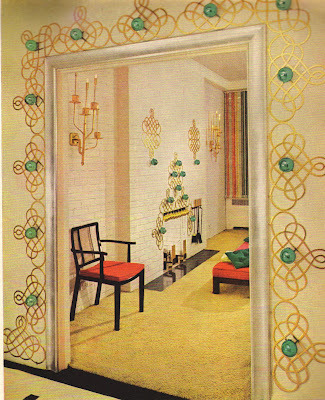 "Line an alcove with a bold pattern. A jog or an alcove becomes an asset if you give it a personality of its own by lining it with an assertive motif." "Dramatize a picture with shutters." 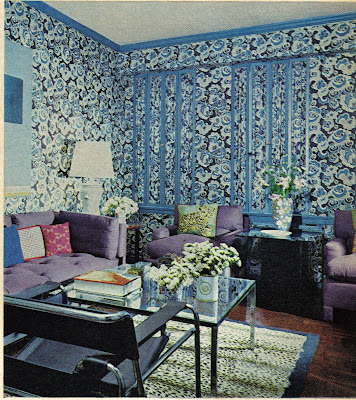 "Match your closet interior and bedrom walls by lining them with the same flowered wallpaper." 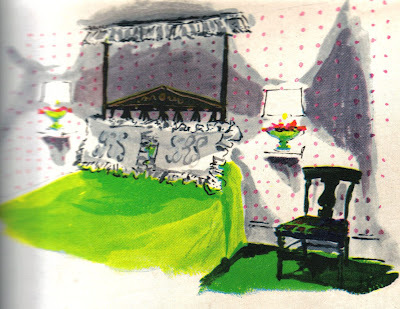 "Paint a headboard, add a ruffle"
"A towel rack of a gay color is used by Mrs. Gerard Lambert to hold magazines." 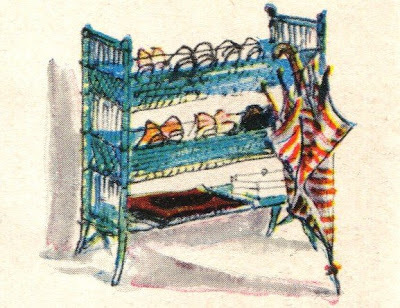 "A wicker stand, brightened by paint, holds Mrs. Gerard Lambert's garden shoes." 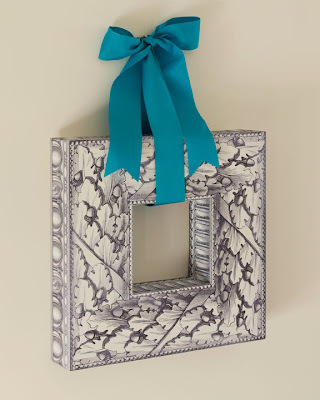 "Paper your walls with plaid chintz. 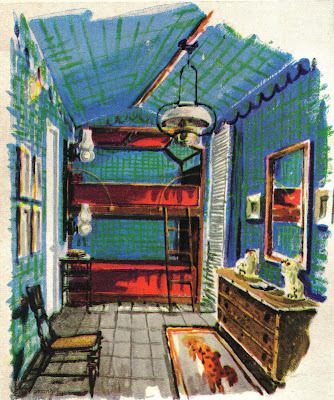 The dashing wall and ceiling treatment which William Pahlmann used for the boy's room...dramatizes odd pieces of furniture." 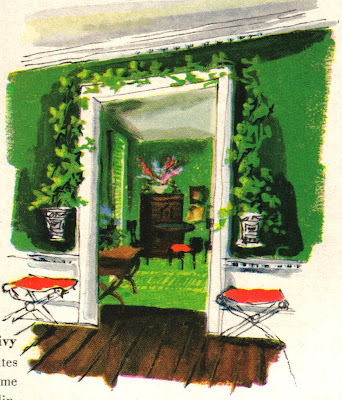 "Frame a door in growing ivy." "Paper a chest to match walls and ceiling." 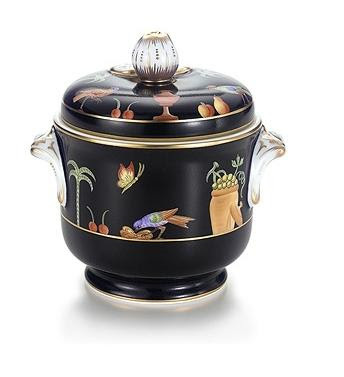 "Transform a bombé chest with black lacquer." 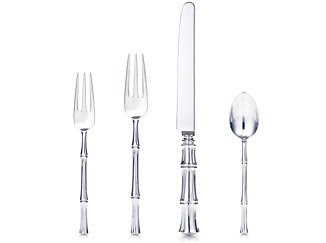 The late, great Tiffany Bamboo flatware that has been discontinued. 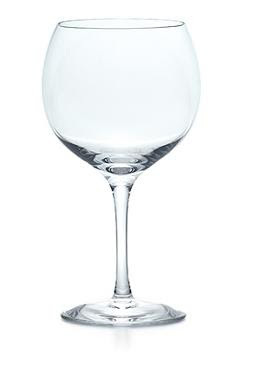 The Tiffany classic All-Purpose Wine Glass . I've used this wine glass for years, and except for the most formal occasions I really haven't needed other crystal. 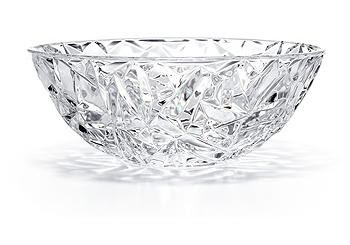 Tiffany rock cut crystal pattern. 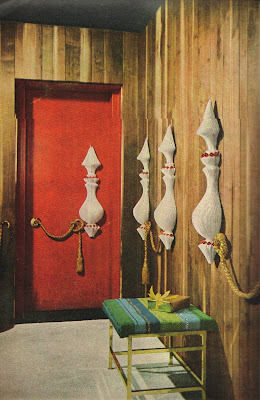 Truth be told, this is not my favorite pattern, but the candlesticks that Truex designed are fantastic. 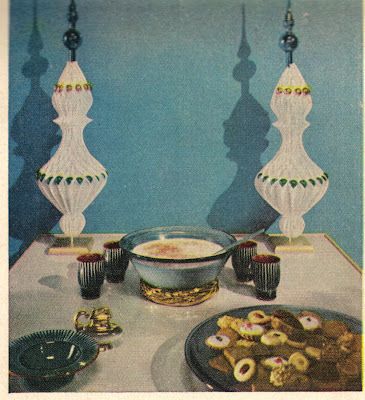 I'm pretty sure the candlesticks have been discontinued, but Tiffany really should consider bringing these back. 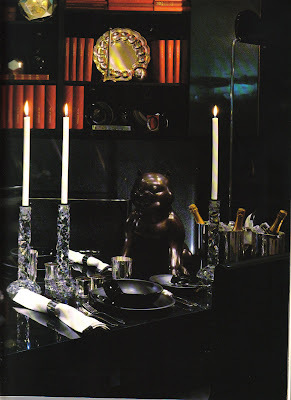 The "Dionysos" decanter Truex designed for Baccarat. If any of you ever have the opportunity to purchase this decanter, jump at the chance! This is hands down one of the best looking, and dare I say sexiest, decanters ever. 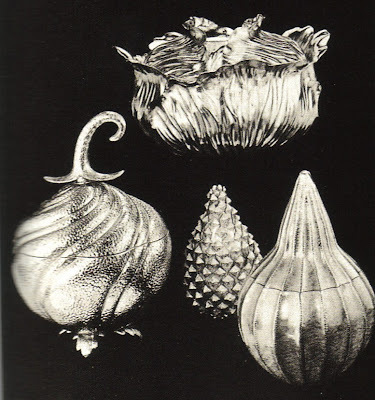 Truex looked to Mother Nature for inspiration, and these sterling seed pod tureens and boxes are the result. This is the type of inventive design that seems rare today. Truex was famous for the Drabware china that he introduced to Tiffany, but he also commissioned "Black Shoulder" hand-painted china. 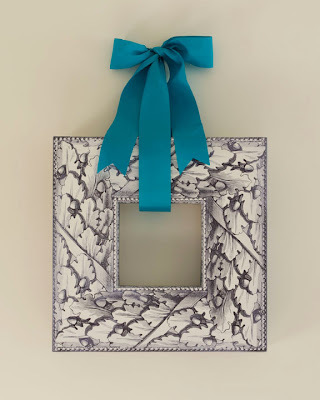 Still available today, this pattern is truly exquisite. Truex's talent was not limited to the table. 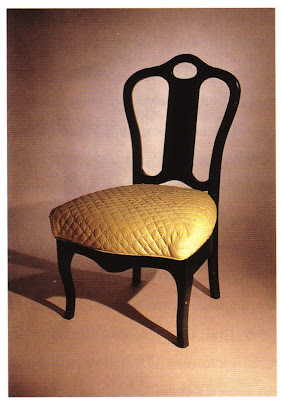 He also designed this handy little chair for Hinson & Co.
Did I mention that Truex was also a painter? This watercolor is available on 1st dibs. And Albert Hadley, a great friend of Truex, has some magnificent Truex paintings in his collection. "Prelude to the Christmas party, reserved for sentimental moments"
OK people, give it up. 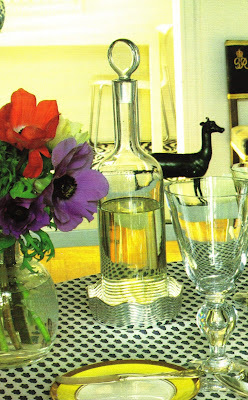 How many of you have had a sentimental moment as such before one of your parties? I'm sorry but not in all my days have I been this relaxed before one of my parties! Now I realize that you're supposed to look this cool and calm in front of your guests, and Lord knows I've tried to do so (and hopefully successfully!). But behind the scenes is this going on for me? I don't think so. Setting a table like this is fun and easy for me. And I enjoy getting myself primped and fluffed before a party. But during the prelude to the party I'm running around lighting candles, keeping an eye on the oven, making sure the ice is fresh, etc. And when I've had significant others who have helped me with parties, I've even been known to be hell on wheels and bark orders at them- in the kitchen and away from the guests, mind you. But does any of this stop me from entertaining? Not on your life because there is nothing more fun...even without these sentimental moments! 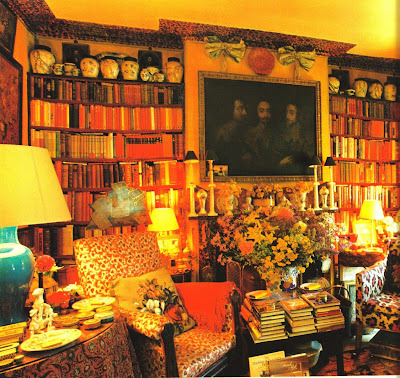 Anytime I'm flipping through Interiors and English Style , I always stop and stare at one interior that is featured in both books- the London home of antiquaire Stephen Long. I can't help but marvel at how much "stuff" he was able to fit into that home! Can you believe it? Now, I think that one reason I spend so much time looking at these photos is because I need a lot of visual stimulation, and you certainly get that with this home. 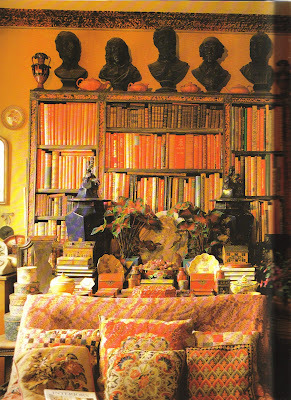 There are layers and layers of objects, books, fabrics, flowers, plants, etc. But that neatnik side of me becomes curious and wonders how does one clean a place like this? Just how dusty do things get? And does one constantly misplace things in a home like this? 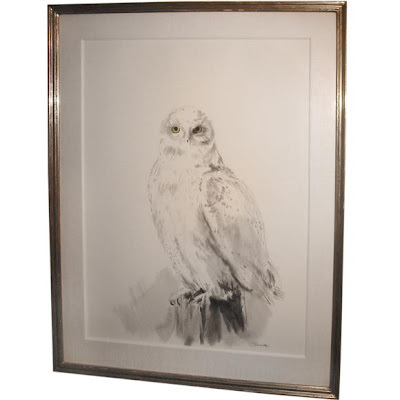 For those of you who may not be familiar with Long, he is considered to be one of the preeminent antiques dealers in London, a profession that might help explain the chock-a-block home. 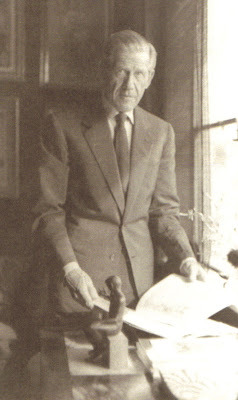 Long once said "If you have only a few things, they must be really good, but if they're not, you have to crowd them up." 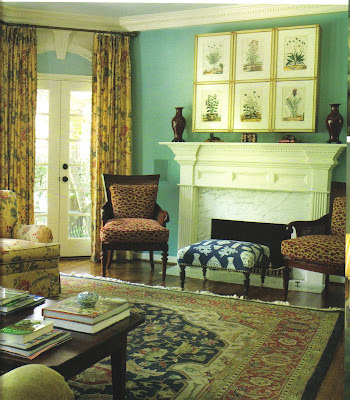 He also chose to lay a strong foundation for each room- bold colors and strong statements like the faux tortoise molding, bookcases, and fireplace. And according to Long, it's the clutter that then softens the whole effect. I think he has a valid point. Long once defended clutter by writing "True clutter is very different from those artfully arranged tablescapes, piles of expensive books and endless buttons and bows aimed to give an instant lived-in look. It is based on the often unconscious acquisitiveness of many of the Human Race who cannot resist making jackdaw nests for themselves with things which have taken their random fancy." Well said, and spoken like a true collector. It's certainly food for thought. But my question is, do any of you live like this? Or do you adhere to a design diet of moderation? 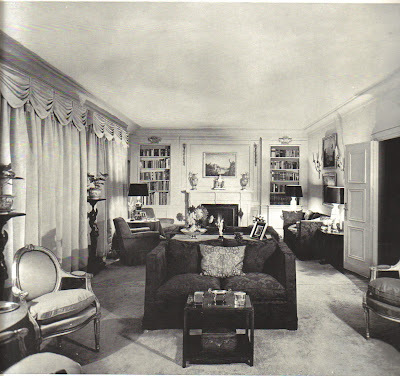 Another view of drawing room. I am so taken with the faux tortoise molding and fireplace, which is hidden behind you guessed it... clutter. 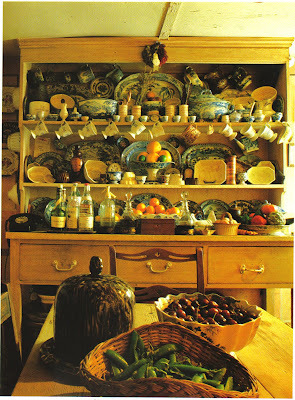 The kitchen shelves are laden with blue and white china and creamware. 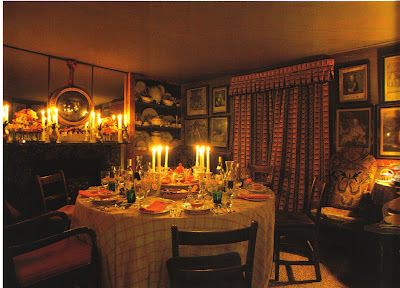 The dining room does not seem as crowded as some of the other rooms. See how pretty the room looks lit by candlelight? Remember this when you're entertaining over the holidays and try using only candlelight. 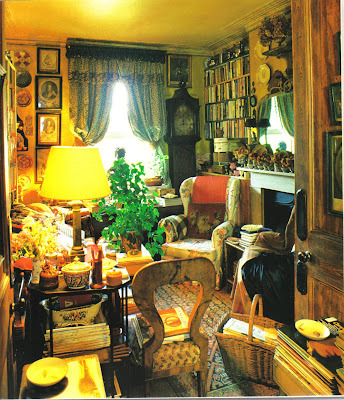 The sitting room. Note the faux marbre molding. The chintz on the armchair is Old Rose which was a favorite of John Fowler, a close friend of Long. 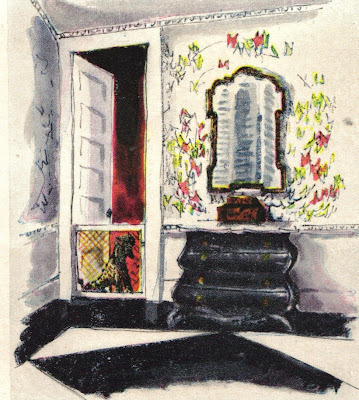 The curtains were made from an 1825 chintz. 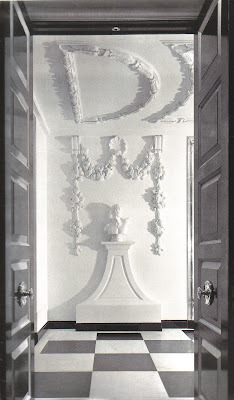 Image at top: Another view of the drawing room. 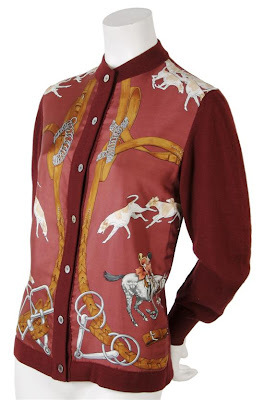 If a date ever shows up at my home wearing an Hermès silk shirt like this, I might not let him get past the door. But I suppose that back in the early 1970s, I might have approved of his choice of attire. 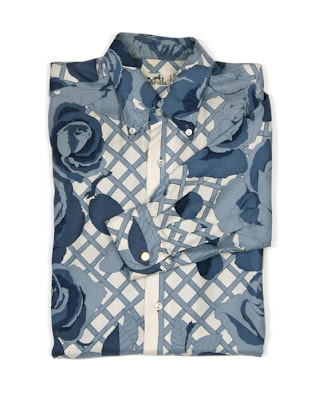 And the man who wore this shirt would have looked right at home in this room designed by Brown and Morrow. 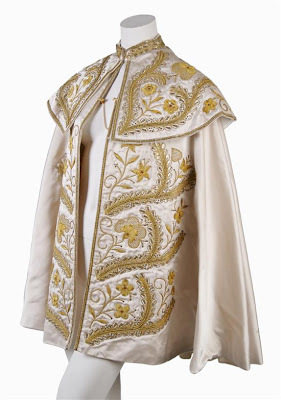 Had I had the chance to visit Ava Gardner in her Madrid apartment (seen above and decorated by George Stacey), I would have worn this cream satin toreador cape. 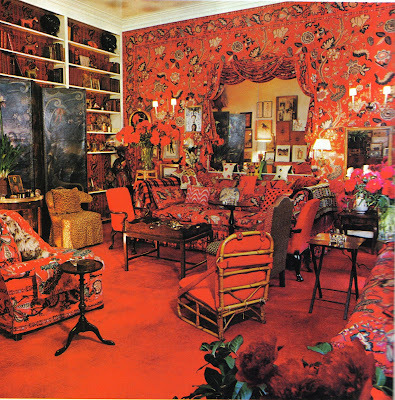 Certainly it would have been a bit incongruous in a rather staid apartment like this, but I would have worn it as a tribute to Gardner's well-known weakness for bullfighters. 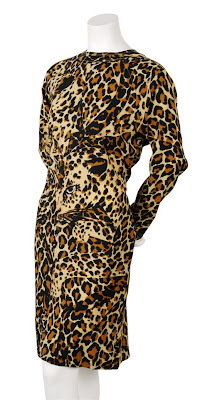 I'm a closet maximalist, so had Diana Vreeland invited me to her Garden in Hell, I think that this Yves Saint Laurent Leopard Print Wool Dress might have been my choice. It might have clashed like crazy with DV's red floral print fabric, but I think she would have approved of this dress. Oh, and I probably would have accessorized with some Kenny Jay Lane. In the spirit of a "Hunt Breakfast on a Kentucky Plantation", I think this Hermès sweater would have been a nice touch. 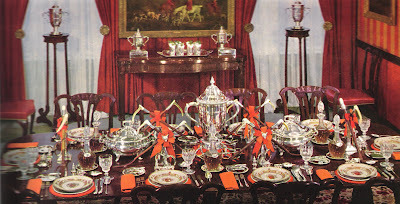 Sure it's a bit themey, but how often are you invited to a hunt breakfast in Kentucky, especially one designed by Valerian Rybar? 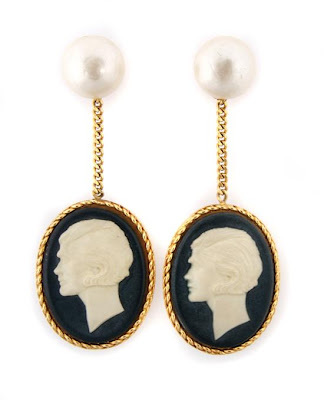 These Chanel cameo earrings scream Dorothy Draper circa 1930s. I can't decide if they're evocative of the Hotel Carlyle or Hampshire House (seen above)- or both! 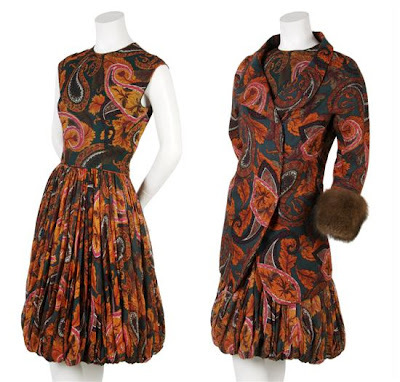 Image at top: I'd wear this Scaasi ensemble (c.1950s) anywhere and everywhere. It would be me and my Scaasi! What Ever Happened to Pierre Deux?